Simple Things – Dancing in the rain! 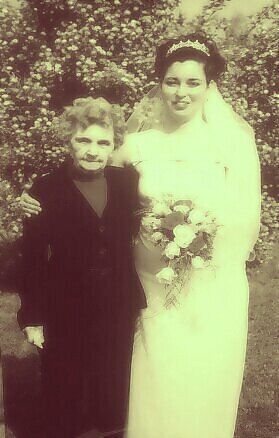 My grandmother Bernice was born January 5 of 1925. It’s easy to describe her but I am not sure that a description could quite do her justice. She was very simple, but not in the way that you would describe someone who was “not the sharpest knife in the drawer”, more like ” She was two dimes short of a quarter! ” and when I say that I mean that money and material things didn’t mean anything to my grandmother. She was sensible and practical and she absolutely wanted to be surrounded by nice things, nice things to her were her family and friends. Her name, Bernice means shining star and she most definitely was the bright light that lit up our world. I can’t describe any grand gestures that made this so, I can only say that she was simply herself and in that we all felt comfortable in being ourselves. She never wanted for more, she wanted to have enough. She was a remarkable woman and I will love and treasure her memory always. The best compliment my husband ever gave to me was to say that my grandmother was one of the best people he ever met. I agree. I also like to think that there is a part of her in me that keeps shining. We strive for all sorts of things in our lives that we think we will make us happy but my grandmother taught me that happiness is a lot simpler then we think. Sometimes the things we stress about have simple answers. I find myself often looking up to the heavens and wondering what my grandmother would do. You’re welcome, Michelle 🙂 Looking forward to your next posts! You’re welcome 🙂 I got just a bit confused because I thought you were already following my blog (http://gammagamification.wordpress.com/) but then I realized that you are following me on twitter 😉 Thank you again for doing so! Now we really have to stop this chat 😀 thank you very much for following my blog. I guess you know you are one of my very important people now? So let me know if I can do anything for you and enjoy reading and commenting on my blog, will do so on yours. You are so right, and this is so Mom. You seem to put into words what we feel but don’t know how to describe… Miss her everyday and it will soon be 4 years since she was with us…..
Meeting people like your grandmother, even just reading about them – I consider that to be a privilege ! Your gran seems a remarkable lady. I can hold onto being healthy and a house filled with love and laughter, thanks to you. Michelle I think of all the grandkids you are the most like our beautiful Mom.Love you both so much. I often do the same, my friend. Beautiful post.